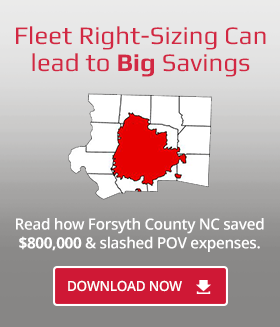 A fleet manager recently looked at utilization rates for a county-run fleet and found that their average utilization rate was only 65% and peak utilization rates never exceeded 90%. Clearly, they had too many vehicles. Or did they? "Pick two cars and let's get rid of 'em," he told the motor pool dispatcher. After another month, vehicle utilization rates remained relatively unchanged. "Pick two more cars and let's get rid of 'em," he said again to his dispatcher. But this time the dispatcher said, "But we're turning people away from our pool because we don't have enough cars.” If they were turning people away due to lack of vehicles, what did their utilization numbers mean? In order to manage fleet efficiency, it is crucial to really understand what the utilization numbers are telling you. Examining the right utilization statistics would have shown the fleet manager that "sedan" utilization rates were hitting 100% -- while across all types of vehicles the utilization rates were only at 65%. 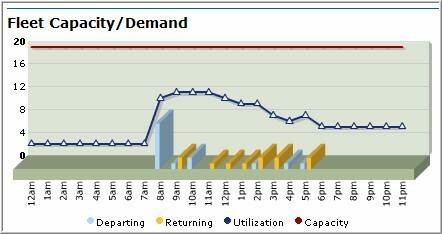 Current utilization statistics should be available at your fingertips with a click of a mouse or an automatic display on a dashboard. Utilization statistics should show trends. To show good trend data, you need to have a repeatable way of measuring utilization. Scrutinize utilization for each type of vehicle...not just the entire fleet. Remember, looking at the fleet as a whole has limited value. Scrutinize utilization based on each site or location individually. Daily Motor Pool – Track the percentage of vehicles used each day. Permanent Assignment – Track utilization by miles per month. Courtesy Fleet – Track how often vehicles are used for purposes such as temporarily replacing vehicles that are in for maintenance. Average utilization is good...Peak utilization is best. Rental Car companies can be your “overflow lot” to tackle peak utilization, rather than keeping too many vehicles for these peaks. One of the best ways to see utilization metrics that demonstrate each of these characteristics is to use software such as FleetCommander. FleetCommander uses automatically updating dashboards to present valuable data to fleet administrators. The FleetCommander Fleet Dashboard automatically shows utilization hour-by-hour. The FleetCommander Fleet Dashboard can be filtered to look at specific segments of the fleet (e.g. by type or location or other parameters). So, fleet managers can see exactly the utilization metrics they need to manage the fleet. Optimizing the use of your fleet to get the maximum utilization is one of the easiest ways to lower costs. Yet many fleet managers may not have the tools to understand their utilization metrics. While some lack the tools, others have the data but fail to understand the nuances of how utilization metrics should be interpreted. Are you clearly seeing the right utilization metrics? There are thousands of metrics that can be used to right-size a fleet and motor pool. If you would like to find out which fleet utilization metrics can drastically cut fleet costs, download our e-book “Using Fleet Metrics to Cut Costs.” It offers an in-depth look at key fleet metrics you can use to reduce expenses. It also addresses outside rentals, dealing with personal vehicle use, and offers expert advice on how to evaluate your own fleet's metrics.